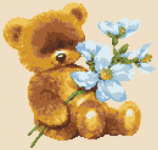 Cross stitch pattern of a happy clown for kids and beginner stitchers. 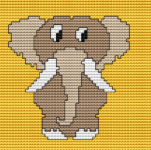 Simple pattern of a baby elephant for boys and girls who adore this cute animal. 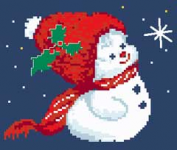 Free cross stitch pattern of a cute little snowman waiting for Santa. Cute cross stitch pattern of a rabbit holding a carrot. Five-color design of a happy lion for kids and beginner stitchers. 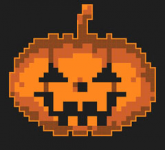 Cute pattern of a pumpkin for your Halloween cross stitch projects. 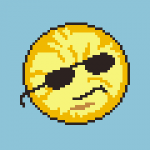 Cute pattern of the sun smirking while wearing dark shades. A lunar themed counted cross stitch pattern.Gloomy Moon cross stitch pattern contains only whole stitches. 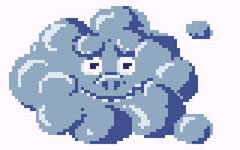 Cross stitch of a happy blue cloud for kids and beginner stitchers. Cute cross stitch of a bunny rabbit holding a pink rose. Designed in light pink and green colors.